Expand your carwash revenue with arches. The Gateway Arch in St. Louis is the tallest man-made monument in the Western Hemisphere and signifies the westward expansion of the U.S. While carwash arches may not be as historic, today’s modern arches have come a long way and can offer an unforgettable experience to your customers — and a chance to expand your carwash profits. Today’s modern carwash arches do much more than greet your customer. They help create the carwash experience by offering graphics, animations and light shows. Arches increase your chances for higher profit margins by creating a positive customer experience. There are three main categories of arches. Let’s breakdown what each of these do for your carwash business: entrance arches, application arches and dryer/exit arches. customer experience and build excitement about the wash. Many times, customers will upgrade to a higher price point to obtain what they saw another customer receive. Additionally, the entrance arch will also give you the opportunity to hide machinery that could be unsightly to the customer, increasing the curb appeal of your carwash. Application arches serve one main purpose: to dispense chemicals or water onto the vehicle passing under the arch. Today’s modern arches are designed to efficiently and effectively provide chemicals by featuring several points of light applications of chemistry and spraying the product from angled nozzles directly to the fronts and backs of vehicles, helping to improve chemical management and reduce product loss, saving a carwash money. Dryer and exit arches give you the opportunity to provide a written message to your customers just before they exit the wash, as their car will be clear of soap and the signs will be visible to the customer sitting inside the vehicle. Not sure what to say? Thank them for their business or remind customers about gift cards. “Dryer arches — and the dryer bay itself — is a great place to present the customer with one last experience. High-power red lighting illuminating the bay can provide the sense that the car is traveling through a hot oven. This has proven very popular with operators and customers alike,” says Baright. It’s not often that we focus on the customer next in line, but think about this scenario. Two vehicles are in line at a carwash: Vehicle A, followed by Vehicle B. 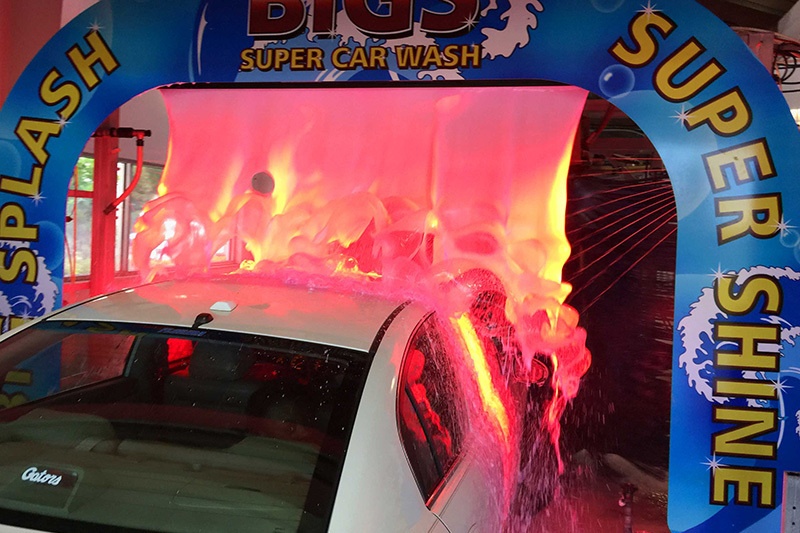 Vehicle A purchases the top wash, drives under the entrance arch and receives a light show, animations and an LED foam curtain. The driver of Vehicle B is impressed and upgrades his or her wash to receive the same royal treatment. They both have positive wash experiences, tell others, purchase gift cards for the holidays and vow never to visit a competitor because they were so pleased with the wash. Now you have two long-term customers — with the potential for more. One positive experience influences another. In addition to creating a pleasing customer experience, carwash arches have been manufactured to apply precise amounts of chemicals and water at just the right time, reducing product waste and use of the public sewer, fresh water and/or water treatment. In today’s competitive market, you need to do more than just wash cars — this is what everyone else does. Putting on a show leaves a lasting impression and creates the potential for lifetime customers. There are some simple ways you can enhance the customer experience. For instance, you can name your arch. It sounds simple, but reading a sign that announces services like “Presoak” seems very boring compared to a sign labeled “Pirates Presoak” (for those who live in Pennsylvania or have an aptly-themed wash). Consider using local landmarks or sports teams to name your arch to give it some local flavor that customers will remember. Also, remember to keep your carwash arches bright, colorful and full of light. Color and light add fun into the carwash environment, which can potentially transform your customers’ emotions into a more positive experience. Arches also allow operators to express their creativity. If you’ve ever stepped foot into a casino, you know that catchy images, animations, bright graphics and lights capture your attention. The same principle can be applied to a carwash arch. Make it fun, exciting and aesthetically pleasing to capture the attention of your customers. Carwash arches have the potential to add to the customer experience and increase your profit margin. As always, no matter which type of arch you choose, be sure to do your research and ask for help from an expert before making a decision. Kristen Corbisiero is a freelance writer, project manager and social media manager as well as a former managing editor for Professional Carwashing & Detailing magazine. Kristen lives in Niskayuna, New York, with her family. She can be reached at [email protected] or (518) 635-0375.